In this paper we initiate the study of the heterogeneous capacitated k -center problem: we are given a metric space \(X = (F \cup C, d)\), and a collection of capacities. The goal is to open each capacity at a unique facility location in F, and also to assign clients to facilities so that the number of clients assigned to any facility is at most the capacity installed; the objective is then to minimize the maximum distance between a client and its assigned facility. If all the capacities \(c_i\)’s are identical, the problem becomes the well-studied uniform capacitated k -center problem for which constant-factor approximations are known [7, 22]. The additional choice of determining which capacity should be installed in which location makes our problem considerably different from this problem and the non-uniform generalizations studied thus far in literature. 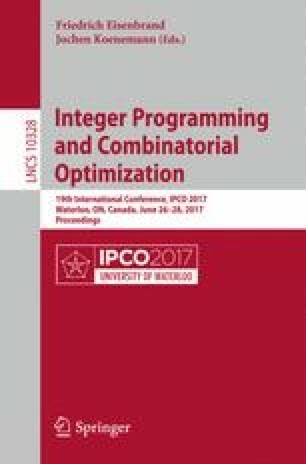 In fact, one of our contributions is in relating the heterogeneous problem to special-cases of the classical santa-claus problem. Using this connection, and by designing new algorithms for these special cases, we get the following results for Heterogeneous Cap-\(k\)-Center. A quasi-polynomial time \(O(\log n/\epsilon )\)-approximation where every capacity is violated by \((1+\epsilon )\) factor. A polynomial time O(1)-approximation where every capacity is violated by an \(O(\log n)\) factor. We get improved results for the soft-capacities version where we can place multiple facilities in the same location. D. Chakrabarty—This work was done while the author was at Microsoft Research India. A. Kumar—This work was done while the author was visiting Microsoft Research India.